Patios make a hard wearing and practical alternative to lawns and gravel gardens; they are commonly made from various types of brick, fabricated slabs, and even natural stone. One of the benefits of installing patios in Abingdon is that they are incredibly low maintenance. Once your new patio is installed by Abingdon’s Complete Garden Services, it will only need a quick clean with the pressure washer in time for the summer. This means you can spend less time weeding, and more time relaxing in your outdoor spaces. Opting for a patio in your garden also makes it easier to change to look of your garden. For example, you may decide to have planters on your patio; these are much easier to maintain that a traditionally planted garden. Using patios in Abingdon to create stylish and practical garden spaces is something we have specialised in for decades. Our professional service includes consultations; this helps us to come up with a design for your patios in Abingdon with as much input from yourself as you’d like to offer. When planning a new patio in Abingdon we need to take into consideration the colour and size of the stone used. We can also offer plain patios using just one type of stone, or patterned patios by varying the type of stone used. Having said this, plain patios can also be incredibly striking; it all depends on the layout of the patio. 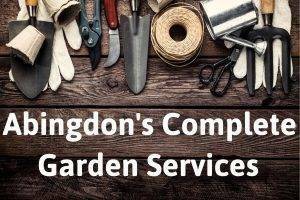 As well as carrying out this service in Abingdon, we also provide garden services in Radley, Sutton-Courtney, and Appleford. If you have decided that the time is right to invest in patios in Abingdon for your home, then get in touch with our friendly team today. We can offer you all the help and advice you may need when it comes to making your choice. As well as crafting beautiful patios, we carry out all aspects of garden design, landscaping, and maintenance.